Andrea has been talking about her Crystal Hills products in development for a long time. I knew that I would enjoy using her products, and I knew that they would be nice and feminine and fancy, but I had no idea how marvelous they would actually be. On June 3, 2016, Andrea invited me to a Crystal Hills Open House at her laboratory in Kelowna. First of all, it is not just a laboratory: the facility is perched on an idyllic hillside, overlooking her organic vineyard and herb garden, adjacent to a peaceful pond, tennis courts and a sprawling house and pool that looks more like an oasis than anything else. The interior of the lab also surprised me, with glass jars containing crystals, herbs and other organic ingredients lined up symmetrically along one wall. The décor is all pristine white, marble, stainless steel and clean glass. If anything, I would have thought it served as a luxury show kitchen, not an actual work space. On the day of the open house, I was overwhelmed. 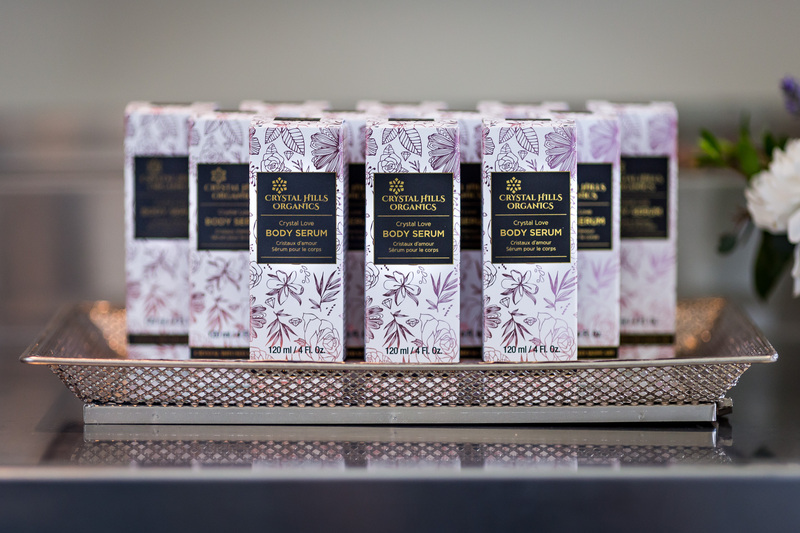 Although I knew what kind of work Andrea and her team had put into Crystal Hills Organics, I couldn’t help but lose myself a little while I was sampling each of the four scents with the sugar scrubs and serums on my hands. The jewelry was so pretty too. It was all so enticing that I could barely contain my excitement. I plan to use the Crystal Dreams, Crystal Love, and Crystal Harmony, but for now I am just enjoying the Crystal Moon Goddess Sugar Scrub and Body Serum. I was swept away by the scents of jasmine and neroli. There is something captivating about this scent that just does it for me right now. Maybe this scent works well for me in the heat of summer. In the shower, I use the sugar scrub (when time allows), and it is the most luxurious experience. I come away feeling revived and refreshed. After my shower, I rub the Crystal Moon Goddess Body Serum all over me, from the chest down. The serum absorbs lightly, and the scent is gentle. It makes my skin feel like silk and fully awakens the goddess within me. I feel younger, happier, and instantly more attractive with each application. Since I try and keep germs to a minimum with everything to do with the kids, I find myself washing my hands and using sanitizer all day long. The skin on the back of my hands really needs some love at the end of the day, and so I have been massaging the body serum into my hands just before bed, which restores moisture and softness to my hands after a long day. Finally, I have been wearing my moonstone drop earrings and necklace from Crystal Hills, and feeling that the crystal vibrations increase my sense of confidence and balance. Thank you, Andrea, for this lovely gift. What can I say? I feel like a goddess.